Jim Freeman is a salesman by trade. His vocation is real estate, but his avocation is locally produced food. Spokesman for the Kitsap Community and Agricultural Alliance, Freeman today (Saturday, April 24) will launch a radio program about local food. I asked Freeman if he has a background in radio. He said not, but he’s willing to try anything once. The programs will be broadcast on KITZ 1400 AM from various local food venues around Kitsap County. Today’s inaugural program comes from Monica’s Waterfront Bakery and Cafe in Old Towne Silverdale. Here’s what Jim has to say about Monica’s. 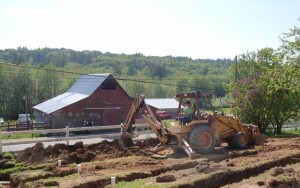 Find out more about KCAA on their website, http://www.BuylocalFoodInKitsap.org. Reader call: Do you know of a historic barn in Kitsap or North Mason county? If so e-mail chenry@kitsapsun.com or call (360) 792-9219. Tell us about the barn, and be sure to leave you contact information. The fire that burned a historic barn on Olalla Valley Road hit owners of the the property, Aaron and Diane Passow, hard. The couple, who bought the place a couple years ago were renovating the barn that Aaron said was a landmark to valley dwellers. The barn is said to be around 100 years old. It sported a bunch of brightly painted sunflowers and a quaint painting of a cow, harkening back to the property’s days as a dairy farm. When Aaron was working on the barn, replacing floor boards and beams, people would stop by to chat and many asked for some of the wood as a keepsake. 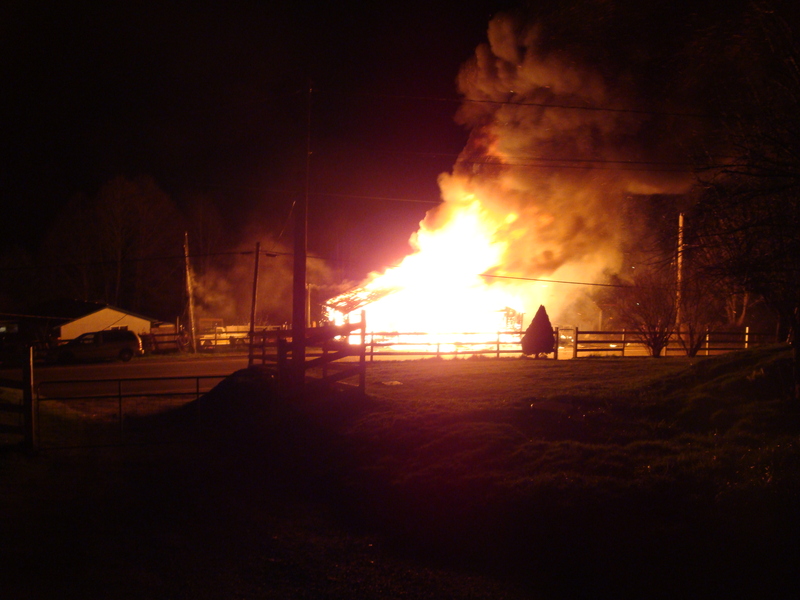 The cause of the fire that leveled the barn is still under investigation. When I was out there today, Kitsap County Fire Marshal David Lynam, who apparently knows a thing or two about cows, held up a charred oval of metal. He said it was a stanchion, used to keep the cows still while you’re milking them. The fire was just one more piece of bad luck the Passows have encountered since buying the place. In one instance, a cement truck overturned, damaging a corner of the roof on their one-story rambler. In another, a youngster driving too fast, skidded off the road and hit a transformer. Oil from the transformer leached down toward their porch. As Aaron was sifting through the ruins, he said, “Hey look at this!” and reached down for a horseshoe. It had been nailed above the door to the barn lo these many years. Aaron took it for a sign the couple’s luck is about to change. Let’s hope so. What: Cosmo’s will donate 30 percent of proceeds to the coop. Members seek to establish a food coop, featuring local foods, in Kitsap County. They are currently evaluating potential sites around the county. Once one site has been established, the group hopes to spread out to other areas of Kitsap County. For more information, call Laura Moynihan, (360) 813-1301. South Kitsap Helpline announced Wednesday that it has finalized purchase of the Port Orchard Nursery. The food bank has been working since last spring to raise funds to buy the landmark establishment, opened as a nursery in 1949 by the Greseth the family. Helpline received a $300,000 grant from the Birkenfeld Trust in May, which helped jump start the fund-raising effort. The sale includes the business site, complete with a two-story home, a store, three large commercial greenhouses, a lath house and plant beds. The nursery is on a bus line and near other social services and free meal programs, which will be a boon to Helpline clients, said Director Jennifer Hardison, in an e-mailed press release. “This purchase will positively impact the lives and health of thousands in our community and beyond, while dramatically expanding Helpline’s services currently offered,” Hardison said. In purchasing the nursery, Helpline’s board of directors hopes to provide food bank clients and local meal programs with fresh local produce year ‘round. Vegetable starts grown from seed will be offered to community gardens and P-patches throughout Kitsap County. The existing home on the site will house agency offices and a clothing bank. The current storefront will be renovated to create a choice-based, self-serve food bank. A teaching facility, complete with a commercial kitchen will be constructed for use by food bank clients and the general public. The food bank will generate revenue by selling flowers, plants, produce and vegetable starts grown and sold both on-site and off-site at local farmers markets. Additional opportunities for revenue include offering paid classes and workshops to the public, as well as renting out the commercial kitchen. Food bank clients and others who volunteer at the nursery will gain valuable skills in horticulture and landscaping that can be transferred to paid positions, Hardison said. For more information, visit www.skhelpline.org or call (360) 876-4089. A 22-year-old South Kitsap woman attacked by a bull Wednesday morning had been recovering from an emergency C-section three weeks earlier. Mother and son are both at Tacoma General Hospital, although Laura Gragg has not been able to see her son, Charlie Luke Gragg, born Sept. 6 at one pound five ounces, since she was admitted Wednesday afternoon to the hospital’s intensive care unit. Laura’s husband, John Gragg, 22, who is in the National Guard, was flown home from deployment in Afghanistan for the birth and had just returned to his post on Monday. The attack took place in a pasture belonging to Laura Gragg’s in-laws, Bill and Linda Gragg, with whom she is staying while John is overseas. Two volunteers from the Kitsap County Sheriff’s Office Citizens on Patrol had asked to check the vehicle identification number of a car in the pasture where the bull and three cows were kept. A VIN number is required before a car can be sold for scrap. According to Gragg, speaking by phone Friday from the ICU, she had asked the volunteers to wait until her father-in-law was home since he is more familiar with the bull. When they came anyway, she accompanied them into the pasture and tried to keep the bull at bay. “I know things can turn on a dime with them,” she said. Turn they did, as the bull knocked her to the ground, pinning her against one of several cars in the field. Gragg said she managed to find shelter between two cars, but the bull came around the other side and again threatened her. According to a Kitsap County Sheriff’s deputy report, one of the volunteers distracted the bull long enough for the other volunteer to help her escape from the field. As soon as we got through, I noticed one of the volunteers wasn’t behind us,” Gragg said. The bull had attacked that man, repeatedly knocking him to the ground, before he pinched the animal in the nose to make it retreat. The second volunteer was transported to Harrison Medical Center, treated for puncture wounds to his right leg and sent home on Wednesday. Laura Gragg hopes to be able to visit her baby in the neonatal intensive care unit of the hospital on Sunday. She holds no hard feelings against the bull. “Just seeing how he was in his territory, there’s not much you can say about the bull acting crazy, because we were in his territory,” she said. Want to Serve on County’s New Food & Farm Policy Council? The Kitsap County Board of Commissioners is recruiting members for a newly formed Food and Farm Policy Council. The 15-member group will advise the board on issues of food production, distribution and access, with a focus on developing sustainable local agriculture. The group will meet monthly to develop strategies encouraging local food production and farming. They also will take part in educational outreach, and help the county develop partnerships with community farms and agricultural businesses. Applicants must represent food production and farming, distribution, buy-local marketing, nonprofits or sustainable communities. Announcement of the policy council on Monday coincided with the commissioners’ proclamation of Sept. 29 through Oct. 4 as “Harvest Week” in Kitsap County. The board encourages citizens to visit farmer’s markets, local farms. Kitsap residents can sign a pledge to eat locally. Pledge cards are available at the commissioners office in the Kitsap County administration building, 614 Division St., Port Orchard. The deadline to apply to the Food and Farm Policy Council is Oct. 30. For more information, contact Jan Koske at (360) 337-4650 or jkoske@co.kitsap.wa.us. Doris Worland of Olalla is old enough to remember when canning fruit was standard practice to help stretch a family’s grocery budget. So it galls her to see fruit in people’s backyards falling to the ground, rotting. It’s bothered her for years. This year, she decided to do something about it. Earlier in the summer, Doris mounted a one-woman gleaning campaign, trying to play matchmaker between property owners with more fruit than they were able to use and local food banks. Despite some publicity and a universal response that “that’s a good idea,” she has not found enough volunteers to make her idea come to fruition, so to speak. Now, with apples and pears getting ripe, Doris, 78, has been picking fruit and delivering it herself to food banks, but a bad back is slowing her down. “I don’t have a ladder, and I don’t think I ought to get one,” she said. Doris is frustrated with the lack of action and the continued waste of fruit. If you have fruit to give away or if you can volunteer to pick, call Doris. She is willing and able to deliver the fruit to the food bank. Contact her at (360) (253) 851-4303 or (360) (253) 970-2047. This press release comes from a member of the Kitsap Community and Agricultural Alliance. A movement is afoot to start a food co-op that will feature predominantly locally grown food. To get a better idea of what a co-op is, check out the Web site for the Skagit Valley Co-op, which I had the chance to visit recently. Our local group will host a showing of the movie “Food, Inc.” at the Historic Orchard Theatre, 822 Bay Street, Port Orchard. The movie runs Friday through Aug. 6 (next Thursday; times are in the press release below). Don’t forget our movie fund-raiser, Food, Inc., playing at the Historic Orchard Theater, is coming up this weekend — opening night is Friday, July 31st! The show runs through Thursday Aug. 6th, so you have plenty of time to bring your family and friends to see the film and support the co-op — you’ll never look at dinner the same way! We’ll be there on Friday before each of the two evening showings to answer your questions and sign up volunteers. We will receive a portion of the ticket proceeds for each ticket you buy when you use your voucher all week long. However, try to make it to an evening showing if you can, as we get the highest donation from the theater for those shows. Go to www.kitsapfoodcoop.org for more details. South Kitsap Helpline and supporters will host a fund-raising event Sunday to help with the purchase of the Port Orchard Nursery. The event will feature King 5 TV personality and master gardener Ciscoe Morris, known for his off-the-wall humor. Earlier this month, Helpline was awarded a $300,000 grant from the Birkenfeld Trust through the Seattle Foundation. The grant will allow the food bank to make a down payment on the property, which has been for sale by the Greseth family. The campaign to raise additional funds for the purchase will kick off with a Garden Festival from 9 a.m. to 5 p.m. Sunday at the nursery, 1012 Mitchel Avenue. There will be a vendor fair featuring gifts, flowers, plants and garden art held in the nursery parking lot. Free classes and workshops for children will also be offered throughout the event. Food and beverages will be available for purchase. Ciscoe will speak from 4 to 5 p.m. Tickets to the talk are $25 and include a reception from 5 to 6 p.m.
For more information and to make reservations for the Ciscoe Morris event, call (360) 876-4089. Food bank plans fundraiser with gardening personality Ciscoe Morris. South Kitsap Helpline on Friday heard they were awarded a $300,000 grant from the Birkenfeld Trust through the Seattle Foundation. The grant will allow the food bank to make a down payment on the Port Orchard Nursery on Mitchell Road, which is for sale. The food bank plans to use the three-acre facility to grow produce for its clients. The nursery was founded in 1949 by Glen and Oleah Greseth. The Greseth’s son E.B. and his wife Kay managed the nursery for 30 years. Now they plan to retire. The Greseths support the concept of the food bank’s growing its own. According to Helpline Director Jennifer Hardison, purchase of the nursery will allow the food bank to expand its services and offer clients classes in nutrition education, cooking and growing their own food. There are also plans to also increase the agency’s vocational skills programs. The nursery presents new opportunities to generate more revenue for the food bank, said Hardison. They include year-round community classes, children’s programs and workshops, seasonal sales of Christmas trees and wreaths, plus on- and off-site retail produce and nursery sales. The remainder of the property purchase price will be made up by additional grants and with funding received from the agency’s capital campaign. The campaign will kick off July 5, beginning with a Garden Festival at the nursery from 9 a.m. to 5 p.m.
A vendor fair featuring gifts, flowers, plants and garden art will be held in the nursery parking lot that day from 9 a.m. to 5 p.m. The fair is free to the public. Free classes and workshops for children will also be offered throughout the event. Food and beverages will be available for purchase. The event will feature King 5 TV personality and master gardener Ciscoe Morris, who will speak from 4 to 5 p.m. Tickets to hear Ciscoe are $25 and include a reception with him from 5 to 6 p.m.